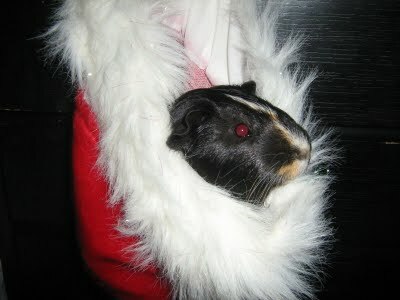 Hang a Santa hat in your rodent cage for a cozy and decorative nest! To hang the hat as a hammock, attach a string to either side of the hat brim and tie another string to the pointed tip so the hat hammock can be tied in the corner of a cage. Attach a string or zip tie to one side of the hat brim and the tip to hang the hat along the side and ground of the cage. Consider filling the hat with fabric scraps for a more padded nest.